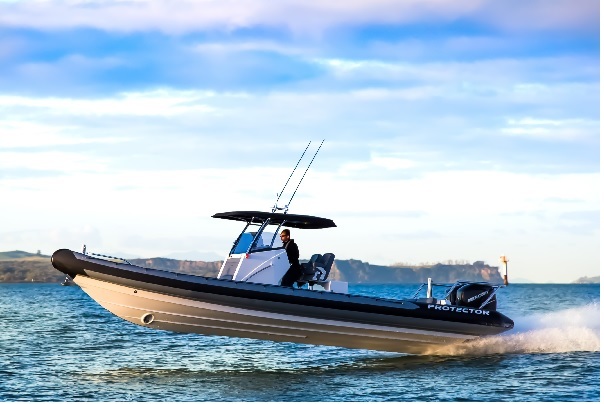 New Zealand built Rayglass Protector RIBs (rigid-inflatable boats) have been chosen as the official patrol boats for two of the world’s major sailing regattas: the 36th America’s Cup and the inaugural Sail GP competition. The agreements, likely to be worth tens of millions of dollars to the local economy, will help keep the iconic Kiwi boat brand in front of some of the largest audiences ever to watch yacht racing. Rayglass CEO Dave Larsen says he particularly pleased with the unique agreement that has been reached between Rayglass Boats and Emirates Team New Zealand and the Royal New Zealand Coastguard. A generous grant to Coastguard New Zealand from the Lottery fund for community benefit related to the 2021 America’s Cup will see 24 Rayglass Protector RIBs, ranging from 9m to 12.5m in length, loaned to Emirates Team New Zealand and America’s Cup Ltd used as official patrol and support boats for the Prada Cup (the challenger series for the America’s Cup) and then for the America’s Cup Match itself. At the conclusion of the regatta, they will be returned to Coastguard New Zealand to distribute around New Zealand’s coastline, major lakes and rivers to ensure the safety of the country’s boating communities. Two years later, Protectors were chosen as the official patrol, crowd control, media and even ambulance boats for the 2000 America’s Cup regatta in Auckland. They reprised their role in 2003 and have been heavily involved in every America’s Cup since. In addition to the 18 9-metre, three 10-metre and four 12.5-metre Protectors that will be used for mark and course setting, crowd control and media, Rayglass Protectors have also, not surprisingly, been chosen as the support boats for Emirates Team New Zealand and the majority of the challenging syndicates. Also choosing the Protector’s unique combination of high speeds, rough water handling and incredible soft riding are the organisers of the new Sail GP competition. Planned to be an annual, global sailing contest held in Sydney, San Francisco, New York, Cowes and Marseille, the new competition uses identical F50 catamarans, capable of exceeding 50 knots. Each of the competing yachts will accompanied by a Rayglass 10m Protector centre console, a first response RIB capable of keeping up with the catamaran’s electrifying speeds — and then fitting in a single container for quick and easy transportation to the next race venue. Popular throughout the world, the Kiwi designed and built Protectors have found favour in most parts of the globe, especially Europe, the United States, Scandinavia, Russia, Asia and throughout the Pacific. Thanks to their incredibly high build quality and ability to travel safely and comfortably at high speeds, in virtually any conditions, Protectors are currently successfully employed internationally as patrol and rescue boats, as support vessels for international yacht racing teams, as fast pleasure cruisers and sports fishing boats, and as superyacht tenders.